Real Techniques brushes are like Pokemon - once you have one, you wanna catch them all! They are an easy thing to be addicted to, so whether you're looking to buy your first one or your tenth, these are my personal favourites and the ones I use the most. If you're new to Real Techniques, let me give you a quick rundown. They're created by makeup gurus Samantha and Nic Chapman (aka the uber talented Pixiwoo) and are simply the best makeup brushes you can find on the highstreet for affordable highstreet prices. 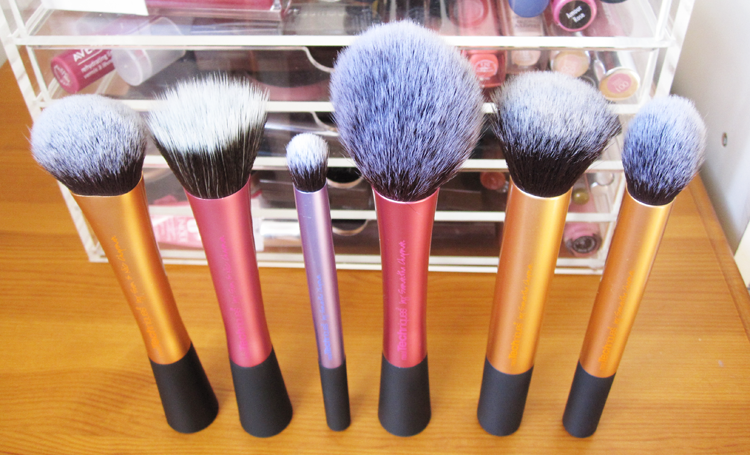 In fact, they're often even better than some of the more expensive and high-end brushes I have! All of the Real Techniques brushes are made with super soft synthetic fibres making them 100% cruelty free. The handles are colour coded and named so you know what's what, they're easy to clean dry quickly after washing and I've yet to experience any shedding problems. I've had some of these brushes for nearly 2 years and they still look great. The newest addition to my Real Techniques family is the Expert Face Brush. I was looking for a good multi-purpose brush that I could throw in my travel bag and this is just perfect. So far I've used it for liquid and mineral foundations, as well as for blush and contouring. The rounded head is small and the bristles are densely packed so you can get a really great flawless finish using it. I especially love it with more fuller coverage foundations because it blends everything so beautifully and never looks cakey or streaky. If you ever experience a bad skin day and just need to cover it up, this is the brush to reach for. I have a couple of duo fiber brushes, but honestly, this is the only one I seem to use on a regular basis because it's soft and just works so well. I mainly use it for applying cream blushers (and it's amazing with Daniel Sandler's Watercolour blushers), but I also use it with light bases such as BB creams and tinted moisturisers. It sheers everything out and gives a lovely light coverage. If you use a lot of cream products like this, pick it up! Technically, this is an eye brush, but the beauty of Real Techniques brushes is that most of them are very versatile. Case in point, this Deluxe Crease Brush is what I use to gently buff in and blend concealer (both under the eyes and over any blemishes). The brush head is a like a tiny kabuki so you can really layer concealer where it's needed. The Blush Brush divides some people, but personally I love it. The head is huge compared to your average blush brush, but for me, I find it works well to blend blusher into a natural finish on my cheeks. I also use this a lot for applying loose or translucent pressed powder on my oily t-zone and to set my makeup. I have a full review on it here. Possibly the most talked about brush from Real Techniques is the Buffing Brush. I couldn't wait to get my hands on this and it's become my number one go-to brush for applying mineral foundation. It effortlessly buffs and blends foundation and works just as well with liquid formulas. This little brush is great for applying product directly in the hollow of the cheeks for a contoured look, and the rounded head shape lends itself perfectly to blending it all out for a soft finish. I sometimes use this brush for less pigmented blushers that I want to layer with, for setting loose powder on my t-zone, and for applying powder highlighter in precise areas. Real Techniques are available via various stockists such as Boots, Feel Unique, Escentual, HQHair, iHerb etc. They're currently on a Buy One, Get One Half Price offer in Superdrug. Do you use Real Techniques Brushes? i absolutely love real technique brushes, i think they are great, and so soft. 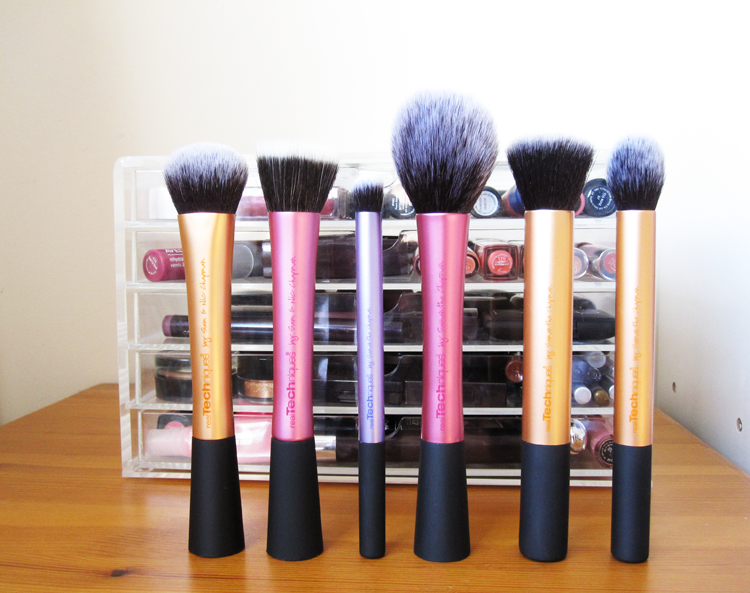 I have the face brush & the blush brush and love them both! The stippling brush is the next one I want to get! Let me know what you think of the Stippling Brush when you pick it up - I love it! I love real techniques brushes too! My favourites are the stippling blush and the buffing brush - I use them both for my foundation and they give such an amazing natural finish. They are fantastic aren't they?! My favourite RT brush is easily the Expert Face Brush and Blush Brush. I love it for blush too, the shape of it is just fab! I loved this post, especially the Pokemon bit at the start :-) I have the blush brush and hated it at first! I can NOT use it for blush but I find it deposits juuust the right amount of product to use as a great bronzer blush and I use it religiously for that, I actually don't ever use any other brush for that purpose so I am always uber pale when my RT brush is being washed!! haha! I honestly don't use anything else except Real Techniques, all the brushes are so fantastic! The Expert Face is definitely my favourite, I'd love to get the stippling brush for my growing collection of cream blushes.